Citing a simmering row between Israel and the United Nations Human Rights Council (UNHRC) over the latter’s decision to investigate Israeli settlements in the West Bank and East Jerusalem, the Sri Lankan government yesterday pointed out the inconsistency of the US position, with regard to the contentious issue of human rights. Addressing the Expo-Sri Lanka 2012 at the BMICH on the second day of the exhibition, yesterday, External Affairs Minister Prof. G. L. Peiris explained the contradictory position taken up by the world’s solitary super power. The minister was referring to an angry reaction of Ileana Ros-Lehtinen, chairperson of the powerful House Foreign Affairs Committee of the Congress, who called the UNHRC ‘Rouges Gallery,’ while urging the US to identify an alternative credible mechanism to address human rights issues. The External Affairs Minister was the guest of honour at the premier exhibition revived after a 15-year lapse. Praising the Export Development Board for making significant progress in spite of various constraints and challenges during and after the conclusion of the conflict, Prof. Peiris recalled how a section of the international community used an international trade agreement for political purposes. The denial of GSP plus tariff concessions close on the heels of the country’s war victory over the LTTE was politically motivated, the minister said, decrying the constant use of trade agreements as political tools. Despite these obstacles, the export sector had been able to face the challenging situation successfully, Prof. Peiris said. Altogether, the UNHRC adopted five resolutions against Israel with thumping majorities. The US has clashed with the UNHRC over the Gaza war report commissioned by the council, soon after the Dec 2008-Jan. 2009 Israeli invasion of Palestinian territory, causing the death of over 1,400 civilians. Prof. Peiris charged that the UN rights panel was heavily politicized and inconsistent, where decisions were made not on sound principles or ethical values but for political expediency. “There is no consistency or uniformity in the UNHRC. When the Rights Council passes one resolution against one country, then the Council is good. When a resolution is passed against another country, then, it is bad. 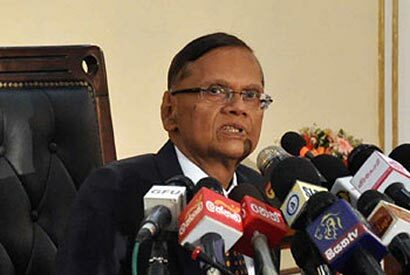 These are all matters of political judgment and there are no objective standards at all,” Prof. Peiris said. Commenting on Russian Federation’s support for Sri Lanka, Prof. Peiris said: “This is the reason why, two days ago, the Ambassador of the Russian Federation in India made an interesting observation that the resolution against Sri Lanka had been adopted for political reasons and he said that the council had done itself a great disservice. These are not matters of upholding human rights and not on grounds of principles or on sound judgment but for political expediency. We have to recognize these realities and strengthen the export sector,” he said. Navi Pillai, are you listening or hiding in shame? Hillary Clinton, where are you hiding without giving answers to these concerns? And, where the human rights champions like HRW, Amnesty International, ICG are hiding? What happened to your big mouths? Come out and lash out with answers, so we can sit around and laught at you guys. I think it is pretty obvious they all have tiny brains and BIG ……..s! They pick a fight with something small to show the world that they have achieved something while the illegal camp in Guanatanamo Bay still exists and for half a centuatry Israel’s land grab continues under the sponsership of the yankees and Monkey Baboon has nobody even to appoint as a panel to advice him. Pathetic is not it?